- I do not believe that a livestock crossing as proposed at the end of Harrison ’s Drove where it meets the Wicken Lode underbank drove is in any way viable, and needs to be discounted from the list of possible crossings. - I cannot express strongly enough to all concerned with development of any gated livestock crossings on public rights of way and other customary access routes through land parcels containing cattle and the Konik breeding herd that local users and members of the Local Access Forum, particularly in the minutes of any meeting, make clear that they do not accept liability for any of the structures proposed or built by the National Trust. I have studied the map of the potential livestock crossing on Wicken Lode underbank drove. I have also referred to the Higher Level Stewardship (HLS) maps for this part of Wicken Fen, as I needed to see how the cattle could access the proposed crossing (at the end of Harrison’s Drove where it meets the Wicken Lode underbank drove) from their current grazing areas. To the north east of the proposed crossing the south bank of Wicken Lode, land parcel 4197, is covered by HC15 . Introduction of cattle to part or all of this area is covered by the agreement. While grazing ‘on part or all’ of this area is included in the agreement, the nature of this particular field parcel, and the existence of the industrial archaeology of the former brickworks, means that grazing cannot be continuous and the management ‘may require the exclusion of livestock in some or all years’. This surely precludes the introduction of a permanent livestock crossing in this location? Also, how would the livestock access the current grazing areas (Baker’s Fen) to the north east of Harrison ’s Drove? Bringing them directly south east would involve trampling over part of the brickworks, then over a specified wetland area with no less than 5 ditches to cross, including the double ditch feature where Norman ’s Mill used to stand. Surely this is the very area of SSSI that concerned Natural England in their response to the original consultation? The HLS scheme also protects the existing drainage ditches as identified on the ditch management scheme map of the whole area. Perhaps the intention is to provide a livestock corridor along the whole length of field parcel 4197? Surely this will conflict with the HLS agreement for this particular area, as well as conflicting with public access around the mere hide entrance, Norman ’s Bridge and the permissive route down the waterproof bank? Then to the south west of the proposed crossing lie the reed beds, field parcel numbers 9752 and 1551. These areas are covered by a variety of designations, including SSSI. High water levels are maintained all year round and there are drainage ditches to cross, including either side of Fuller’s Drove. 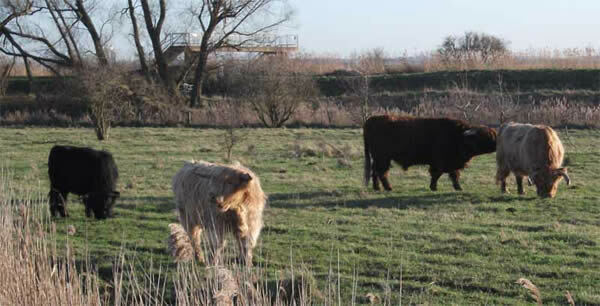 No grazing is included in the HLS scheme for this area at Wicken, and the SSSI has to be kept in favourable condition. A livestock corridor in this area would cause unacceptable damage to the SSSI as well as being entirely impractical. Therefore, taking all these points into consideration, I do not believe that a livestock crossing as proposed at the end of Harrison ’s Drove where it meets the Wicken Lode underbank drove is in any way viable, and needs to be discounted from the list of possible crossings. On the subject of gates I note that the National Trust has concluded that ‘box gates could potentially cause an unreasonable inconvenience to some users at this particular location ( Harrison ’s Drove)’. The box gates cause unreasonable inconvenience at any location! Since receiving your revised options for a livestock crossing on Harrison ’s Drove I have been researching the legality and liability of installing gates authorised under HA Section 147, and have found information from other equestrian groups around the country. There are various points about the livestock crossings and their ‘risk’ in your response document that require further discussion. There is a difference between gates that are a statutory part of definitive route – in other words gates included as limitations in the definitive statement, and those installed following authorisation under HA Section 147. The risk of an accident to the passing public at a statutory gate on a PROW is the responsibility of the Highway Authority. The risk to the passing public at gates constructed as part of a work activity – such as control of conservation grazing livestock – is the responsibility of the landowner or person/s erecting the gate. All accidents and incidents at gates should be recorded, and landowners like the NT with a policy to promote and encourage access to their land should also have a policy about recording such accidents and incidents. At statutory limitations on a public right of way, accidents and incidents should be reported to the Highway Authority; and at limitations authorised under HA Section 147 accidents and incidents should be reported by the landowner to the Highway Authority in the case of a minor accident, and to the HSE as a RIDDOR in the case of a major accident. How many members of the public know this? I certainly didn’t know the distinction between statutory and authorised limitations until I researched the issue nationally. The Inspector at the PI that confirmed public rights to Harrison ’s Drove will most certainly have understood the difference and it is the liability issue concerning the difference between statutory and authorised limitations that explains her remark about confirming the route without any statutory limitations. The design of conservation grazing gates is in part driven by funding via the HLS scheme, and self-closing gates are encouraged. These have caused problems and accidents all over the country where conservation grazing projects have been introduced. Elsewhere in the country there are statutory bridleway gates onto traditional open grazing land, moorland etc that contain grazing livestock that do not have these excessive mechanisms, and livestock owners and horse riders have been using these gates happily for years. So why the difference with conservation grazing? The description of the farm livestock that they ‘should not generally present any threat’, rather implies that the herds at Wicken would pose a safety threat. Why would that be? 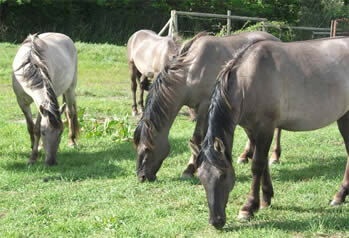 The Konik herd at Wicken contains stallions and uncut colts as part of a ‘natural breeding’ project. This is in many ways based on the management of the Oostvaardersplassen reserve in Holland – a large area of wetland with no public access. It is the presence of ‘entires’ that drive the risk to the public passing through the grazing enclosures – particularly those on horseback. Stallions and colts may try to recruit mares or challenge geldings, putting both the horses and their riders at risk. This is why local riders have pleaded for livestock free through routes. As a breeding herd, mares with foals also pose a risk to the public. The sight of mares and foals may encourage the public to seek a closer look. Mares can be unpredictable and ‘foal proud’, and will suddenly attack an unwary onlooker. While the HSE guidelines Cattle and Public Access (AIS 17EW) does not refer to horses, as horses are not a usual ‘agricultural’ animal in the UK, the guidelines for the safe management of ‘entires’ and breeding herds is as valid for horses as it is for cattle. The Koniks at Wicken are not wild (although they are allowed to live naturally) nor are they feral (domestic escapes into the wild). They are livestock, therefore the liability for the animals and all the ‘works’ associated with them is the responsibility of the National Trust under the Occupiers Liability Acts, the Health and Safety at Work Act, and the Animals Act. 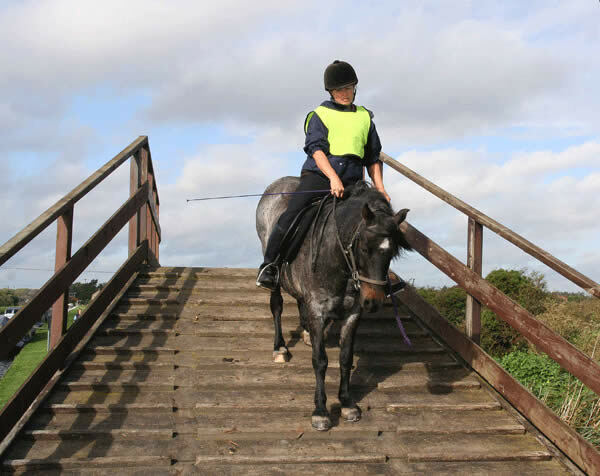 Throughout the consultation process, and at the Local User Forum, horse riders have over and over again objected to the use of gated livestock crossings on public rights of way that are used as through routes. We have been given choices based on the requirements of the NT, and not been given a user’s choice of no gates. As far back as 2006 we alerted the NT to the difficulties of crossing Harrison’s Drove with livestock, and suggested that an up and over livestock bridge was the only solution. Although dialogue and demonstrations of various gates and latches are valuable, it is very important that individual riders and the Fenland Bridleway Association do not agree or approve the design of any of the structures associated with the security of the NT’s livestock, as this could be considered as part liability for any accident occurring at an ‘approved’ structure. Also, once ‘approved’ by riders and the Bridleway Association, any difficulty with the gates by riders could be considered as being poor horsemanship. Apparent approval happens very easily. Joy Fuller and I met you on Friday 20 April 2012 at the box bridleway gates on Priory Drove, so that you could witness how difficult these multiple gates are for a mounted horse rider. We pointed out the dangers as we saw them, and Joy concluded with you that she was unable to use the gates without assistance, and therefore the customary use of this route was lost to her. Now, in the light of my understanding of the potential for liability, I cannot express strongly enough to all concerned with development of any gated livestock crossings on public rights of way and other customary access routes through land parcels containing cattle and the Konik breeding herd that local users and members of the Local Access Forum, particularly in the minutes of any meeting, make clear that they do not accept liability for any of the structures proposed or built by the National Trust.